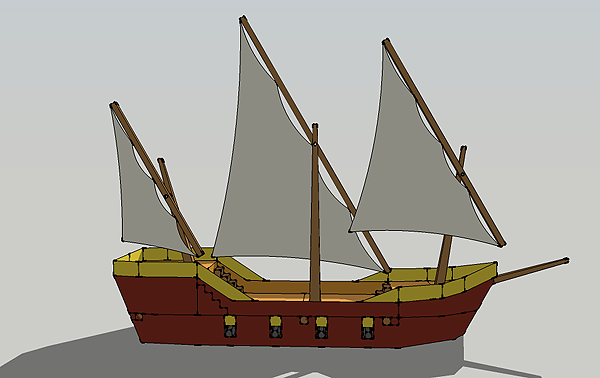 Marauder ship 1st paper test. 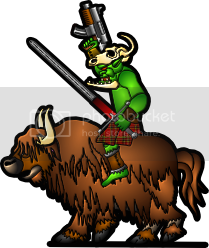 Rrrrrrrr, will there be cannon? Well, maybe. But I'm going to keep it simple -- a wedgy beam sitting on a box, basically. This one definitely has a place in my next Flashing Steel campaign! Can't wait! The connector method should be similar to what I've used on my couple of house models that have interiors. 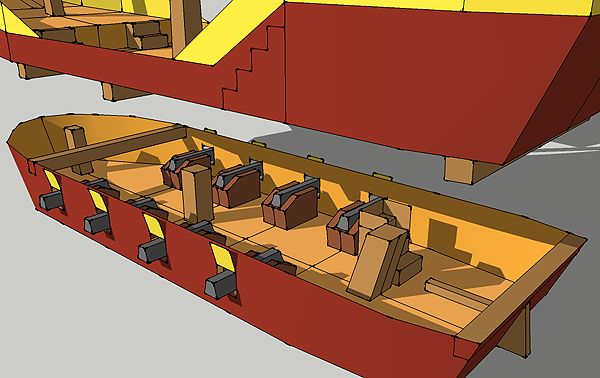 The beams on the bottom of the main deck fit against matching beams along the top of the lower deck, locking in front-to-back motion. 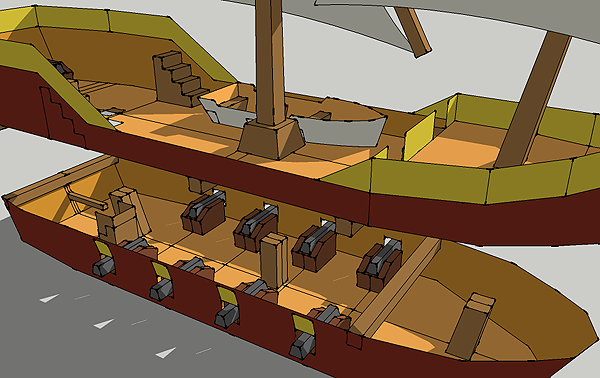 The lower deck's walls should block side-to-side motion. 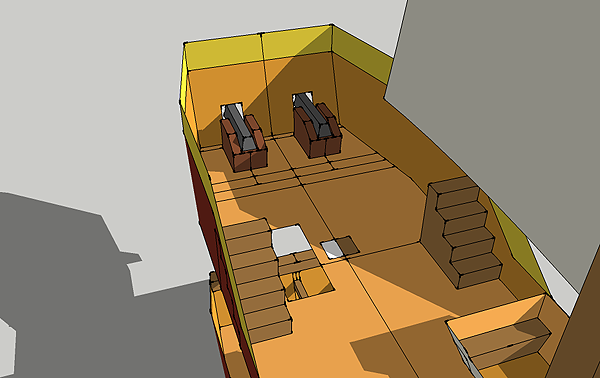 To better conceal the join, I'm planning to add a small lip along the bottom of the main deck. (Not shown.) I'll need to scale down the lower deck by like 2% so that everything sits well. That's what I meant by a wedgy beam on top of a box for the cannon. I might try a cylindrical/conical design if it doesn't make me cry when building it. To unfold the cone, I'm going to use Pepakura. After you mentioned it I tested it out before with a cone and a truncated cone I made in SketchUp and they seemed to unfold okay. Didn't paper-test it, but it looked all right on the screen. I'm not sure how to do the gun hatches. In real life, they would be held up by ropes connected to the main deck. 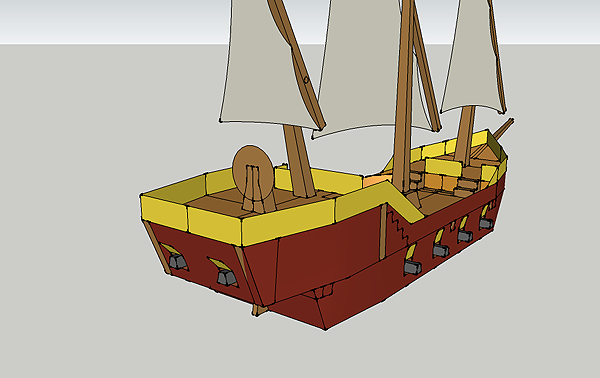 I might use a wood-textured tab and a small slot cut into the hull, so you have something to fit them into while they're held up. And when the hatch is down, you can tuck the tab inside, and it should help to keep the hatch closed. I think. It might be really crummy-looking. Something for the next paper test. The original concept is now the Low Rider Option. 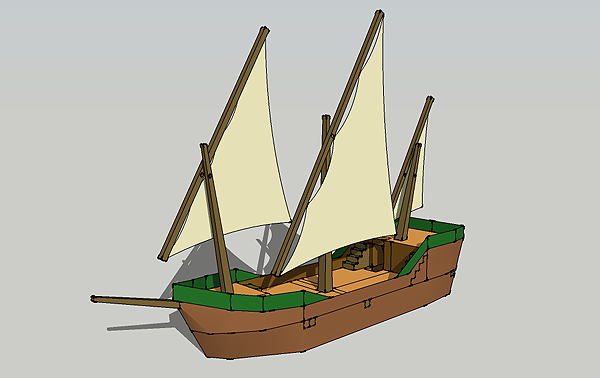 I like the options of (so far) 3 different ships (low rider, merchant and pirate). 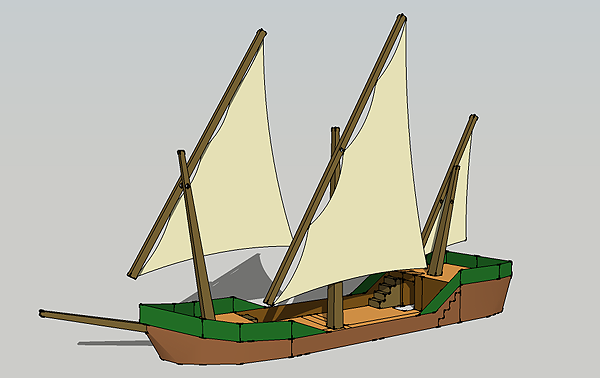 How about adding a couple of different masts to it, like one or two masts with rectangular sails? 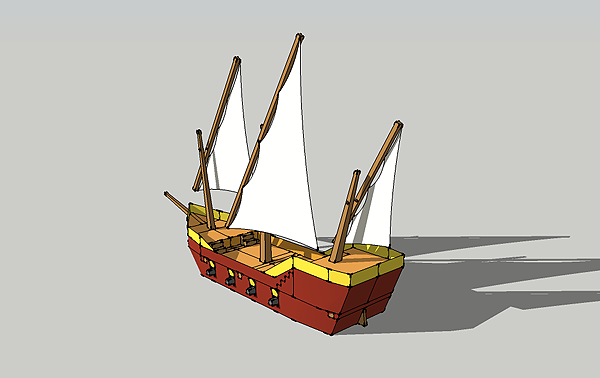 You could even - if it is possible with that model - make an additional middle section so builders can make the ship longer if they wish. What do you think about an octagon barrel with a bronze texture? Maybe an image of a bronze lion at the back of the cannon and at the touch hole? 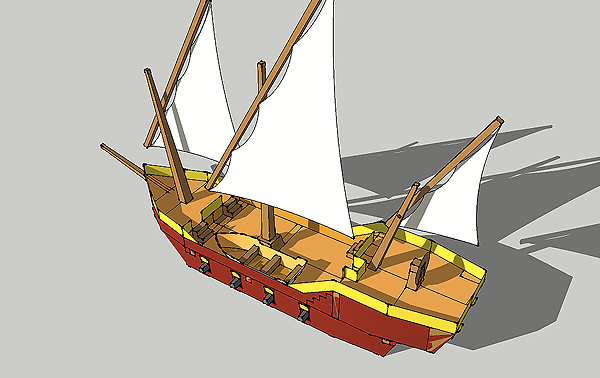 Octagons used to be very common on early cannons. Beautiful. I'll have some as soon as it ships... ehrm, as soon as it's available! 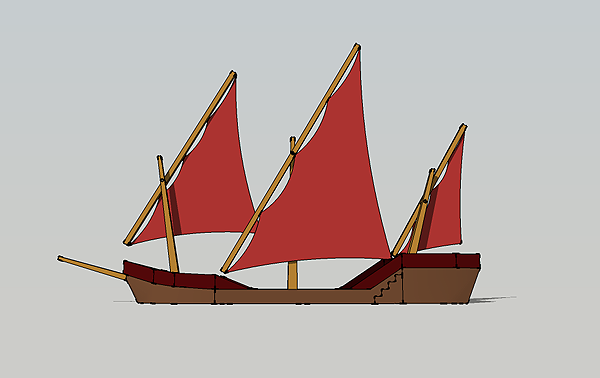 Add some mast/sail shape options, maybe a longer/modular middle section, please. Oooooooh. Glad we are playing an RPG now, means I can just add in things this supperb without having to swap our game every week....... 'y'know that dungeon campaign we've been playing, well now you've been kidnapped by pirates'. Great suggestions, everybody. I'll try some of them, but I don't want to fire all my ammo at once. I mean, there will be other ships. Oh, I'll be digging into my Warhammer books for inspiration, you betcha. I think you can see the Marienburg sourcebook in the background of some of my photo shoots. I've been up all night making changes. 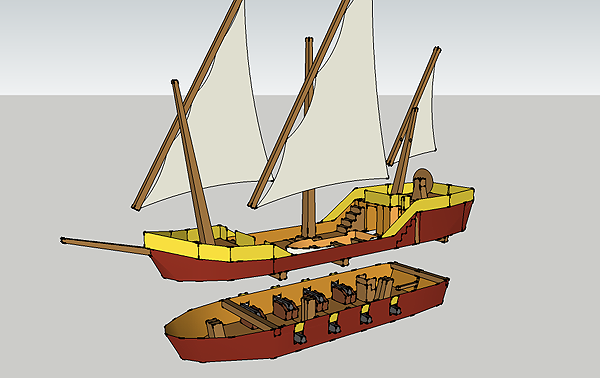 The main differences are the skiff, taller sails, the wheel, and the extended cabin (adding two rear-facing cannon). 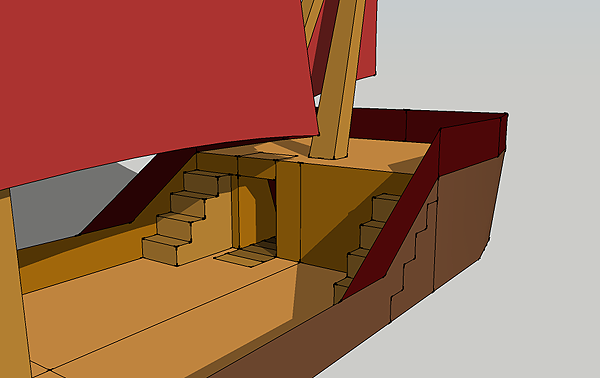 - for the lower deck, consider adding a few vertical wall braces along the inside wall of the hull to help keep the hull in a straight line for the upper deck to fit over. 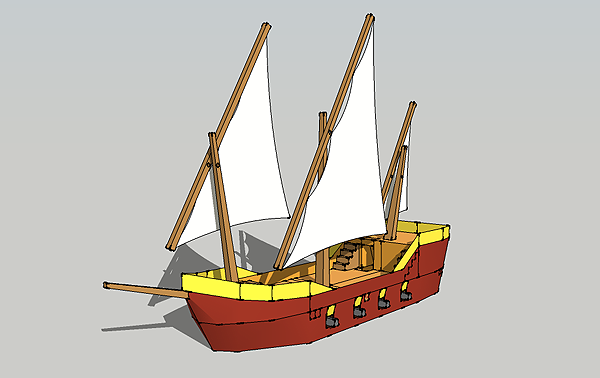 Otherwise, it will likely bow outward and make it difficult to put the upper deck on. The cross beams you've shown could obstruct game play. 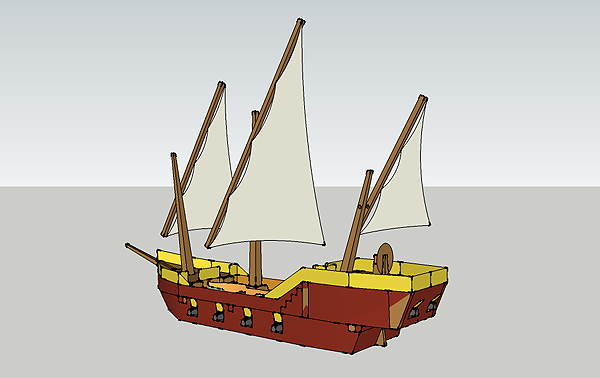 - Consider assuming foam core for the upper deck and fastening the masts though the deck, like Tom did with the Medieval sailing ship. This makes the masts very stable. PS. Dave, check your PMs re your question. 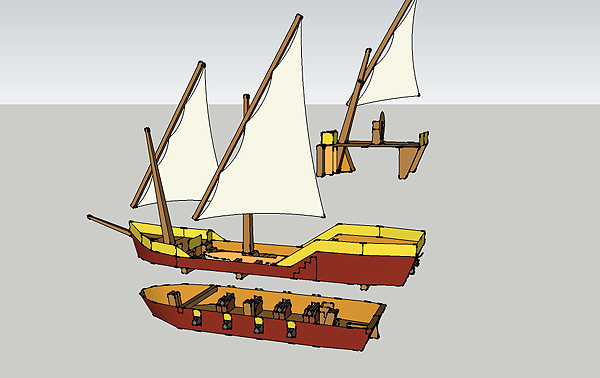 I prefer the merchant one because my games don't have gunpowder but I would like the option for cannons. You have a fairly complete set of norther european medieval style buildings. Have you considered some eastern Japanese/chinese or Indian/Thai style stuff? Could you include a make an option to print half the number of stairs but twice the width so they can accommodate 25mm bases without the staircase blocks? I know it looks less realistic, but my friends and I agree that it would be nice to not have the extra pieces to fiddle with. note: This is sort of a general request but I thought it made the most sense to post it on a current project. 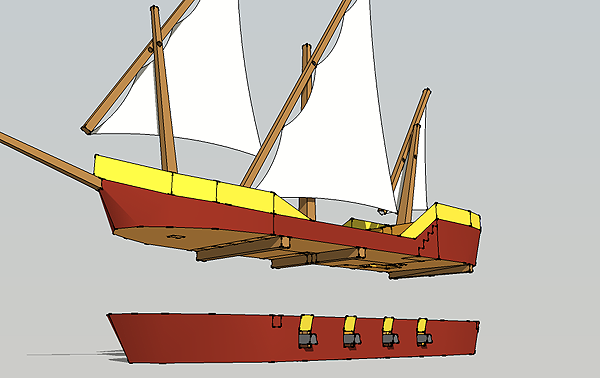 Dave, you could simplify the bracing on the underside of the upper deck by using open, triangular beams. 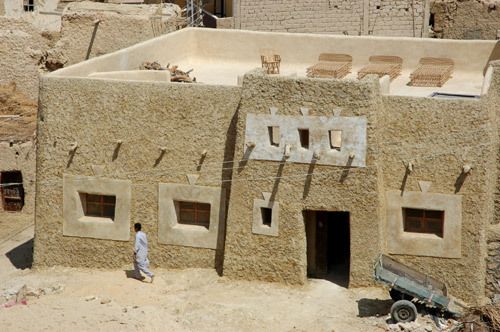 They are much easier and faster to build than square beams, and stronger as well. 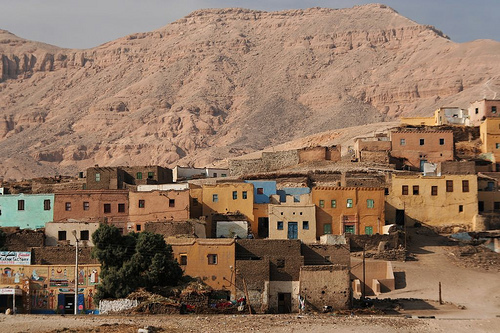 I was thinking that some desert culture type stuff would be cool. edit: Sorry, totally off topic but I couldn't help myself. 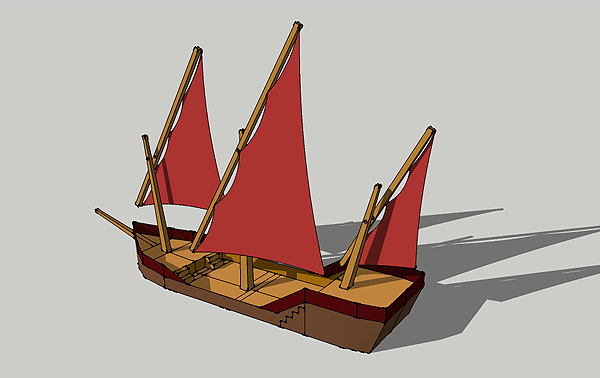 edit: To bring it back in-line here is a nice Egyptian ship. 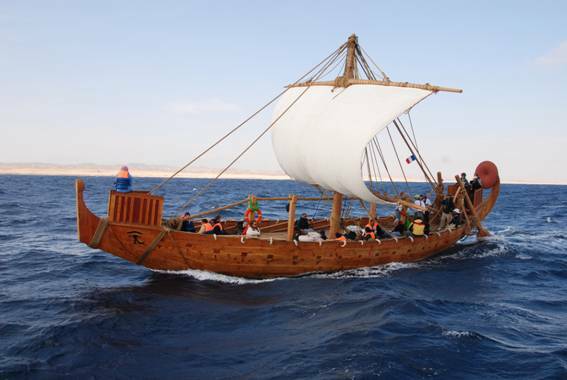 Ancient boats like these could be a lot of fun for some settings. My assumption about Dave has been that he makes the building he does because I think he lives in the UK where they have those kinds of old buildings lying around all over the place. Just a guess really. No, he does not live in the UK. This gets better and better! Can't wait! I'm putting this project aside for now. It's gotten so far away from the original concept that I don't know where I'm going with it any more. So I'm starting something else to clear my head. I'll try to answer some of the questions. I like the braces. I'll try that next time. Have you considered some eastern Japanese/chinese or Indian/Thai style stuff? I'm sticking with European fantasy/medieval and scifi for the time being. You have a fairly complete set of norther european medieval style buildings. But my wish list for this stuff goes on and on! I'm committed to using 1/4" squares after wrestling with this problem. The problem with 1/2" steps is that they have to fit in the same footprint as a staircase of 1/4" steps. So each step up is 1/2". It looks silly on a house model. To have a more gradual climb takes up twice the length of a staircase of 1/4" steps. It's a nightmare. Honestly, I think the best solution is to put the mini next to the staircase and just say "he's on the stairs right here" until he moves elsewhere. Or use the little insert pieces. But I would just fudge it for the brief and rare moments when a mini is actually doing something important on stairs. Unless you're playing in some scenario where it's just staircases everywhere, which would be awesome. I was mainly thinking about war-gaming where models have to be in the correct spot. 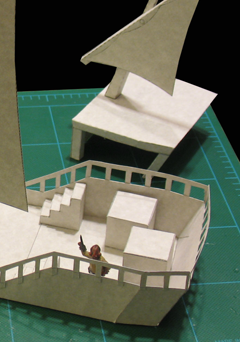 I realize it looks silly to have 1/2" high steps, but for my war gaming group it is way more practical. Not like you don't already have to make room for miniatures standing on top of the blocks. I suppose I will just have to brush off my Photoshop skills and do it myself. Maybe I will also make them 1.25" wide while I am at it to accommodate the "plus" sized miniature. I wonder where he gets the UHU glue pens from . Only place I have seen them sold lists them in British pounds. As for stairs, the next model I build with stairs I plan to cut flaps at the back of the base of each step to make a “catch” for the base of miniatures to prop them on the steps. Something like fat dragon games “climbing wall” (that is where I got the idea anyway). As for stairs, the next model I build with stairs I plan to cut flaps at the back of the base of each step to make a "catch" for the base of miniatures to prop them on the steps. Something like fat dragon games "climbing wall" (that is where I got the idea anyway). The complex spiral staircase in FDG's EZ Dungeon Deluxe set has precisely that. The flaps in the risers bend inward and upward to catch the edge of the mini base. But the Tom also included a simplified spiral stair that essentially consists of three 1"x1" platforms at three heights, showing an image of four steps on each platform. This is a way of avoiding having long stairs. It's a balance between realism and playability. I'm putting this project aside for now. It's gotten so far away from the original concept that I don't know where I'm going with it any more. To give my unsolicited opinion, I think you should stick with something relatively simple for the first release, like your first image without the lower deck. 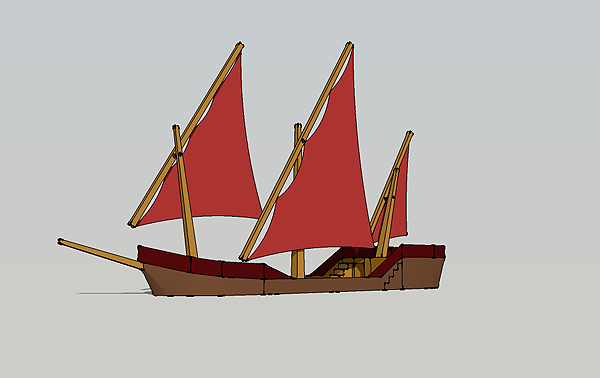 You could expand the sides of the hull down a bit to bring it up out of the water a little. 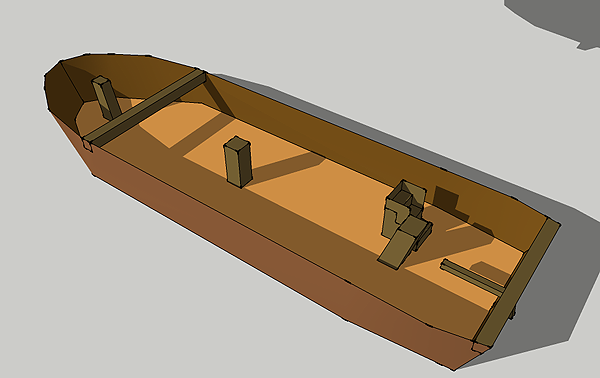 And you could include a simple 2D lower deck map for game play; but no complete lower deck, no canons, no overhanging stern-castle, etc. This way you can be paid for the hours you already put in on the basic geometry and textures, while you work on future expansions. My two cents. Unbelievable... 30hrs... amazing starter project/s (here and in Floatin' Kitchen thread)! 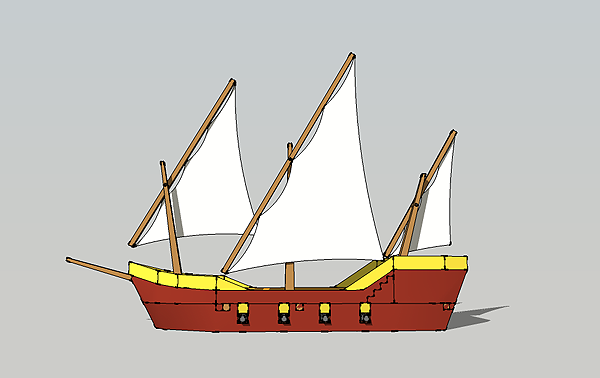 even if simplified ones, I would like to be able to get more ships for my minis (and then later more sophisticated versions as well)! it might be really, really AWESOME series!!! 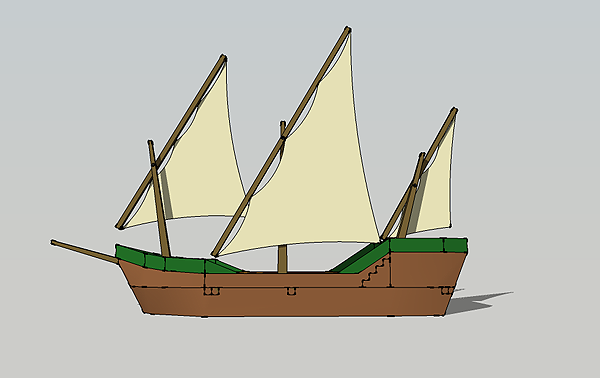 afet: This was a great way to learn SketchUp and work out some of the complications of sea vessels both as a 3D digital models and paper constructions. I applied what I learned to the floating kitchen and I'll be moving forward with that project, so it really wasn't time wasted. mesper: I'd like to design some of those things if I live long enough. But I'm sticking with medieval fantasy and scifi genres for the foreseeable future. Hope you get to revisit this one. I was really looking forward to it. 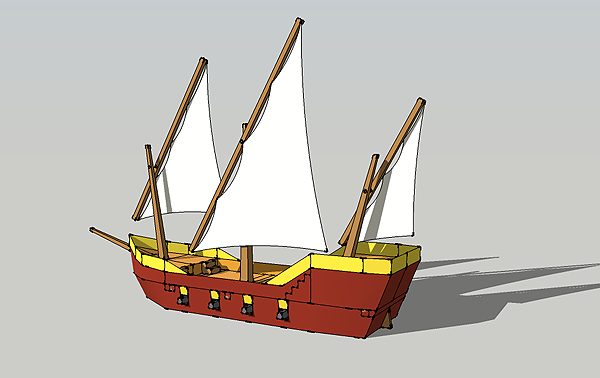 You didn't even get to see the four-masted version!